1. Is there anything sweeter than a dad and his little boy??? 2. I found a Dora the Explorer/Sponge Bob breakfast at the JW Marriot Desert Ridge. It is RIDICULOUSLY overpriced, Tyler could possibly hate it, but her obsession with Dora leads me to believe that we must go! They had better have Eggs Benedict! YUM! 3. It is officially HOT! So hot when you stand in the parking lot at drop off/pick up, you can feel the heat radiating off the pavement. This is how I judge how hot it is, IT IS HOT! 4. I am going for another pelvic ultrasound on Thursday, yet again, I plan on drinking 48 oz of Diet Coke-not water, and yet again, I probably won't drink 48 oz! The technician has no idea, NONE! My bladder would literally BURST if I drank that much! 5. Karissa messaged me that I look "stunning" in the above picture header, which I went to look at further, and in my opinion, I look tired and old. I thought it was REALLY sweet of her to say I look good! I miss her, she is so good for my ego! 6. 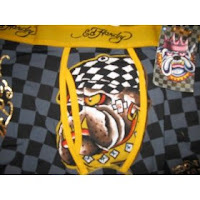 Guess what Pat got for Father's Day. . .Ed Hardy boxer briefs! You know you want to get your husband some! 7. I think Megan Fox is HOT, Pat denies thinking she is HOT and tells me other people are more attractive, but seriously. . .SHE IS BEAUTIFUL! 8. Jackson and I are going to see Up today with his class while Tyler is at school. I can't really imagine a class of FOUR YEAR OLDS at a movie, but this is the activity that was chosen, so I go along with it! What can I say!!! 9. Jackson is OBSESSED with turning four and a half. He thinks that when he wakes up on Saturday he will have: cake, presents, do whatever he wants, etc. Is it bad that I want to feed into it because I think it is so cute!??? 10. I love the circus, LOVE IT! I don't think anyone else likes it as much as me, so we never go, but I think it is sooooo fun! Pat and I used to go before we had kids, now we have kids and we don't go. There is something wrong with that! who's Megan Fox? I'm going to google her right now. Did you find her? She is in Transformers, and now she is rumored to be dating that Shia Lebuff dork, that's how the conversation started because I think she is WAY TOO GOOD FOR HIM, and I don't think Pat thinks so, weird! Colleen, the boxers made me laugh out loud! How funny! I think you should have taken a picture of Pat's face when he saw them for the first time. Was it love at first sight for him too??? I agree, Megan Fox is gorgeous - something about her eyes and hair. Is she really seeing Shia???? That's crazy. He will forever be that dorky little kid from the Disney Channel. Mother's Day Gift-a month later!